Imitation is a form of flattery, right? Over the years, we have seen and heard of countless movies. Coming from a country that has the privilege to enjoy movies from all over, including Asia, Bollywood and Hollywood, you must admit that Malaysian viewers are generally well-exposed to films. Time and time again, we come across remakes and parodies of popular movies produced either in a different country or language. You might be surprised how long the list goes if you start typing away on Google. But we decided to compile a few from some of world’s biggest movie industries, as well as a few local ones, that were inspired by other films. Warning: Some of these may be unexpected. Directed by Martin Scorsese, this 2006 crime thriller film is a remake of the 2002 ‘Infernal Affairs’ from Hong Kong. Fans of the original movie starring Andy Lau, Tony Leung, Eric Tsang and a star-studded cast would remember the story about a police officer who infiltrates a gang and another police officer who is secretly working for the same triad. The Hollywood version also stars a bunch of A-listers, including Leonardo DiCaprio, Matt Damon, Jack Nicholson and Mark Wahlberg. While ‘The Departed’ also shares a similar plot as ‘Infernal Affairs’, two characters from the former is also said to be loosely based on real-life gangster Whitey Bulger and a corrupted FBI agent John Connolly. ‘The Departed’ turned out to be a huge success, bagging several awards including four Oscars at the 79th Academy Awards! This inspired film certainly took a positive turn critically and commercially. Remember the Chinese film ‘The Eye’ from 2002 starring our very own local actress Lee Xin Jie (Angelica Lee) that made everyone afraid of undergoing eye surgeries for a while? Hollywood made their own version with the same title in 2008, with Jessica Alba taking the lead role. The two movies revolve around a classical violinist who has been blind since she was a child. At the age of 20, she receives a pair of new eyes from a cornea transplant. But as her eyesight returns, not only is she able to see clearly now, she starts seeing things that regular people don’t see. She begins experiencing terrifying visions, like people that are already dead. In fact, the original Hong Kong-Singaporean version directed by the Pang brothers was so good that two sequels were born from it. The movie also inspired a Tamil version in 2004 titled ‘Adhu’, as well as a Hindi version, ‘Naina’, in 2005. Let’s bring in a bit of French inspiration. The 2004 action comedy ‘Taxi’ is a remake of the 1998 French film, again of the same name. Many people may have forgotten about this, but the American version stars Queen Latifah, Gisele Bundchen and Jimmy Fallon! Do you remember that the ‘Late Night’ host was once an actor? Both ‘Taxi’ films chronicle a talented driver who sets a new speed record and decides to pursue a brand new career as a taxi driver. However, this new career that may seem basic at first quickly turns into a nerve-wracking experience as the taxi driver is forced to chauffeur an incompetent rookie police inspector while he tries to solve a string of bank robberies hitting the city. The refreshing distinction between the two movies is in the lead role itself. The Hollywood version stars a female as the speedy driver helping the loser cop chase a group of bank robbers who are female, while its French counterpart is pretty much an all-male story. The French ‘Taxi’ directed by Gérard Pirès also went on to inspire four other sequels that probably could have been more creative with their titles – ‘Taxi 2’, ‘Taxi 3’, ‘Taxi 4’ and ‘Taxi 5’. The 1997 film ‘Chachi 420’ tells the story of a divorced father who resort to posing an elderly nanny in order to be with his children again. The Hindi film is strikingly similar to the 1993 comedy ‘Mrs. Doubtfire’ by Chris Columbus, with the late Robin Williams playing one of his most iconic roles. The story is based on a novel by Anne Fine, titled ‘Alias Madame Doubtfire’, which addresses themes of divorce, separation and how this can affect a family. On the other hand, ‘Chachi 420’, which translates into ‘The Trickster Aunt’, was directed, co-produced and co-written by Kamal Haasan. While its Hollywood counterpart went on to win awards like an Oscar for Best Makeup and a Golden Globe for Best Motion Picture – Musical or Comedy, the Bollywood version was not too shabby. It actually received a 7.4 out of 10 rating on IMDb! In fact, ‘Mrs. Doubtfire’ also inspired another Indian version in 1996, but in Tamil titled ‘Avvai Shanmughi’. And guess what? This film stars the director of ‘Chachi 420’ himself as the leading role, Kamal Haasan! He must really love the character. Literally translates to ‘God You Are Great’, ‘God Tussi Great Ho’ is a fantasy comedy made in 2008. Written and directed by Rumi Jaffery, the Indian film has quite the line-up, including Amitabh Bachchan, Salman Khan, Priyanka Chopra and Sohail Khan. The story revolves around a television anchor who is trying to be successful in his career. However, luck is not on his side. Who does he blame? God. One day, God appears before him and decides to grant him the power of God for 10 days to see how he handles it. You guessed it. This film is similar to another 2003 comedy we all know and love, ‘Bruce Almighty’, starring Jim Carrey. While many critics and reviewers have pointed out the similarities to the Hollywood film, the director of ‘God Tussi Great Ho’ explained that the movie was inspired by a village folk tale about a Brahmin boy. But down to the main character’s career as a reporter? We’re not sure about that folk tale, friend. Unfortunately, the Bollywood version suffered the same fate as its main character because it suffered badly at the box office. In ‘Mere Yaar Ki Shaadi Hai’, the main character Sanjay is surprised to find out that his old friend Anjali is getting married. Not only did it come as a shock, he is also devastated because he has been secretly in love with her for years. With the support of his roommate Ria, he embarks on a journey in attempt to stop the wedding. Well, as with most sabotaging, things don’t go according to plan. Now, this storyline sure sounds a lot similar to the 1997 American romantic comedy ‘My Best Friend’s Wedding’. Who can forget Julia Roberts in this well-loved role? Despite the similarities, the Hollywood version instead sees a female character chasing down her best friend whom she is in love with. 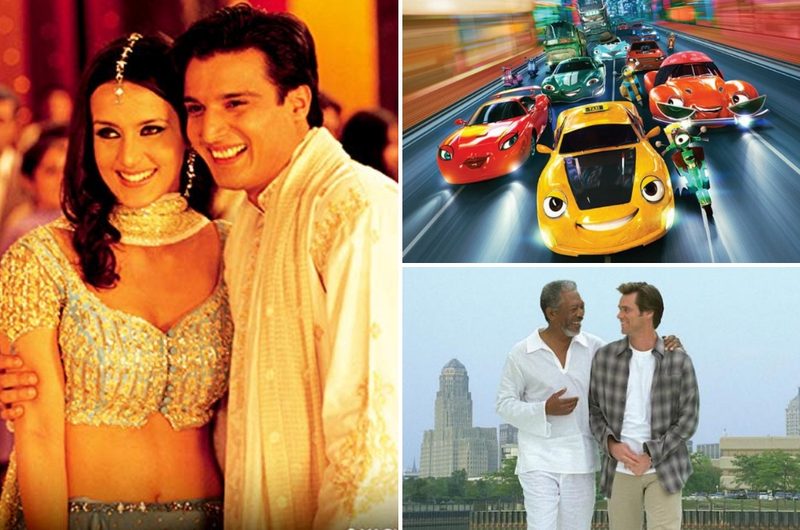 Many people were once again quick to note that the 2002 Bollywood film has one too many similarities to ‘My Best Friend’s Wedding’, director Sanjay (did he name the main character after himself?) Gadhvi claimed that he drew inspiration from earlier Hindi films. He went on to explain that ‘My Best Friend’s Wedding’ was only one per cent of the film’s inspiration. Nevertheless, the movie was a hit at the Indian box office. So, inspiration or not, kudos to both! Based on the movie title alone, you can tell which film inspired ‘I Know What You Did Last Raya’. The 2004 Malaysian production portrays a group of friends – Dr. Mira, Lan, Fazzly, Yasir and Sahida – who gets kidnapped by a criminal named Man. It turns out that the kidnapping is fueled by a string of old grudges and revenge that accumulated after a long time. After that, mysterious events start taking place, causing chaos at the village. One day, on the eve of Hari Raya, the group got into an accident after hitting a goat and a random man. From that moment on, the group is disturbed by more mysterious happenings. Yup, this local film is loosely based on the Hollywood thriller from 1997, ‘I Know What You Did Last Summer’, a story about another group of friends who are stalked by a killer one year after covering up a car accident they were all involved in. Since you can’t really run away with that title, the Malaysian thriller directed by A. Razak Mohaideen is labelled as a parody. We never looked at car accidents and malam Raya the same way again ever since. Try saying that title five times in a row because this writer couldn’t. ‘Usop Wilcha Menghonjang Makhluk Muzium’ is a 2015 comedy written and directed by Mamat Khalid. It tells the story of a Malaysian museum that organises an exhibition on Western ghosts and goblins in an effort to attract more visitors. However, behind the exhibition lies a hidden agenda – to bring Count Dracula back to life, also known as Vlad the Impaler. This unfortunate resurrection is condemned because it could lead the country into chaos. So, in a mission to stop Count Dracula, the wax figures of famous rulers like Sultan Melaka, Bendahara Tun Perpatih Putih, Datuk Maharaja Lela and Perak Man also comes back to life. Without a doubt, the American comedy starring Ben Stiller, ‘Night at the Museum’, inspired the creation of this local movie. Although both films are loosely based on wax figures that come to life in a museum, the Malaysian version incorporates quite a bit of historical facts that may be unknown to us. It also reminds people of national artefacts that we no longer know or care about and probably worked better than our Sejarah classes. This was a crucial differentiating factor between the Malaysian and Hollywood movies. ‘Usop Wilcha Menghonjang Makhluk Muzium’ turned out to be a good satirical film that received rave reviews from the audience. Staring at the poster alone, you can sense which animated film ‘Wheely’ takes after. Although we hardly see animation remakes from different countries, this one is a first for Malaysia. Directed by Yusry Abd Halim, this local animation is one of the latest resemblance we see at the silver screen. It tells the story of Wheely, who is degraded from an aspiring rookie racer to a lowly cabbie in the lower ranks of society. One day, he is faced with an uphill battle when he tries to save his dream (car)girl from a monstrous 18-wheeler truck, who turns out to be the mastermind behind a luxury car-napping syndicate. Now, you cannot deny the similarities between ‘Wheely’ and ‘Cars’, the 2006 Pixar film. Especially after the latter made a trilogy out of their own version. Following a similar world around racing and, well, cars, you cannot help but compare both films. But shortly into the film, you can tell that they are each their own film. We also appreciate the fact that ‘Wheely’ was released in both English and Bahasa Malaysia. Regardless of the reviews, we appreciate the effort behind producing more animated films in the Malaysian film industry. So, these are some of the movies we know and hear of that have taken inspiration from other, either more or less popular, movies. Well, as they say, imitation is a form of flattery. Right? Jaa ERA Lepak Rumah Shah Rukh Khan! Aishwarya Rai Cuba Bunuh Diri?